Magnificent red and blue faux georgette lehenga saree. The lovely resham work, lace, multi work and stones work throughout the attire is awe inspiring. 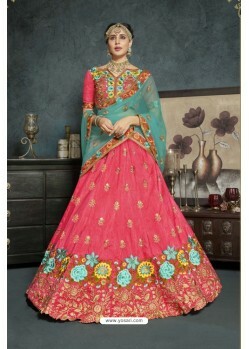 Paired with a contrast red color designer blouse Its a pretty faux Georgette saree for wear on Festival and Reception. faux Georgette Fabric and Red, Blue color Resham and Stone used to make this stylish Saree.